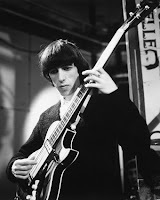 I may have missed it, but Bill Wyman’s website made no mention of his birthday yesterday—his 72nd. The former Rolling Stone didn’t acknowledge his latest mile marker, preferring to let it go unremarked. Perhaps he no longer finds it worthy of mention, age being an aspect of our lives that seems to have only a slight connection to our subjective, lived experience. Born 24 October 1936, he was born only about a year and ten months after Elvis Presley, who had he lived would have turned 73 years old this year, and roughly three months from his 74th birthday. According to this interesting blog entry, Bill Wyman “has the distinction of being one of the last of the Sixties rock and rollers to do national service in Britain.” And as the author points out, the last American rock 'n' roller of historic significance who was conscripted was Jimi Hendrix. Had he lived, Hendrix would have turned 66 years old next month (born 27 November 1942). It was in the age of George III that the aforesaid personages lived and quarreled. Good or bad, handsome or ugly, rich or poor, they are all equal now.